Featuring the magical Sarod player – Souryadeep Bhattacharyya. Souryadeep Bhattacharyya is a well known name among the new generation of Indian classical musicians. He is a “Gandabandhan” disciple of the legendary sarodiya Pt.Alok Lahiri under Guru-Shishya Parampara and has an unique and versatile playing style encompassing the Maihar, Shahjahanpur and Gwalior gharanas of sarod. He has several awards and honors to his credit including the National Gold Medal in Non-Percussion Instrumental Category (Association of Indian Universities-2008), Pt.Nikhil Banerjee Memorial Award (Dover Lane Competition-2009) and is a B-High Grade artist affiliated with All India Radio. Souryadeep has been performing with distinction and critical acclaim nationally and internationally both as an Indian Classical Musician and a World Music performer and composer. 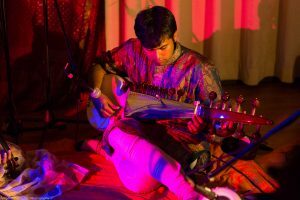 Souryadeep was an IndianRaga Fellow in 2014 and a mentor at the 2015 IndianRaga Fellowship. Read below about Souryadeep’s favorite Fellowship productions and why he enjoyed working on them. Learn more about Souryadeep and his music at his Facebook Page and Website.